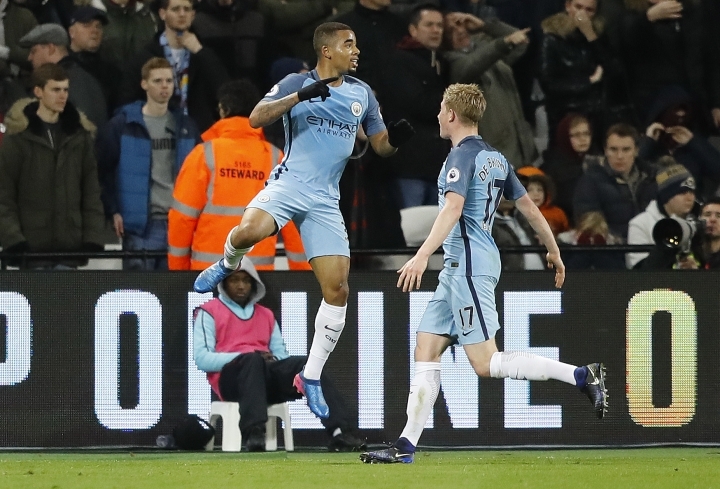 LONDON — Marveling at the prodigious talent of Gabriel Jesus from afar, Pep Guardiola had to wait six months to discover if the Brazilian was equipped for the challenges at Manchester City. "You never know," Guardiola said. "It is like a watermelon. You have to open and see how it's going to turn out." Overflowing with flair and vivacity it turns out, just like he did in Brazil. City teammates have already been glowing about the 19-year-old forward's mindset and maturity. The Olympic gold medalist was signed in August for 27 million pounds ($35 million) but stayed to complete the Brazilian season with Palmeiras and only recently became eligible for City. In three appearances, Gabriel Jesus has injected a fresh dose of dynamism to the team. In his first English Premier League start on Wednesday, he scored one goal and set up another for Kevin De Bruyne in a 4-0 rout of West Ham. "The prospect is good," Guardiola said after the game, picking up from the watermelon analogy. "That's why we push him there because he's a young, young player, young talent." In a short space of time, Guardiola has seen how Gabriel Jesus can enrich City's high-pressing game, with his clever touches and good instinct in the penalty area. "He has a huge mentality, so aggressive," Guardiola said. "He has dreams ... to become something in the world of football and, of course, we are going to try to get it for us." 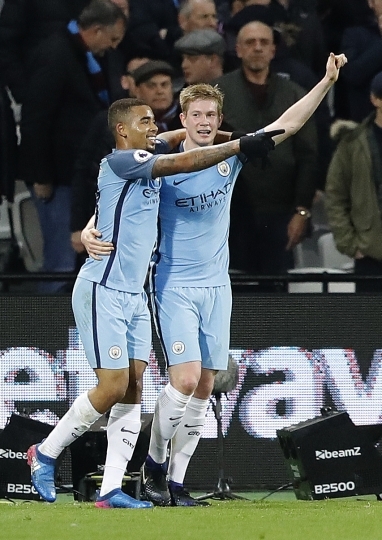 Gabriel Jesus has slipped seamlessly into a talented triumvirate up front with 22-year-old Raheem Sterling and 21-year-old Leroy Sane. "They are so, so dangerous," Guardiola said. "These three guys are the future of the club. You cannot see in Europe another big club with strikers this young." — Guardiola's former club, Barcelona, has Lionel Messi (29), Luis Suarez (30) and Neymar (24) leading the attack. — At Real Madrid there is Cristiano Ronaldo (31), Karim Benzema (29) and Gareth Bale (27). — Paris Saint-Germain has Lucas Moura (24), Edinson Cavani (29) and Julian Draxler (23). — Juventus has a front four comprising of Gonzalo Higuain (29), Juan Cuadrado (28), Paulo Dybala (23) and Mario Mandzukic (30). — Chelsea has been deploying Pedro Rodriguez (29), Diego Costa (28) and Eden Hazard (26). With Guardiola extolling the virtues of youth, that might not bode well for 28-year-old Sergio Aguero. 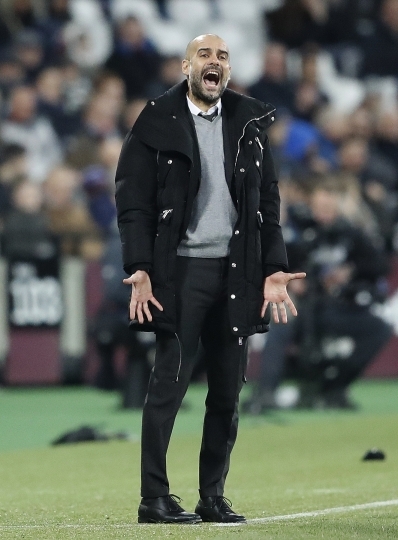 The Argentine had a rare night on the City bench at West Ham before going on in the second half. He might have to get more accustomed to that watching brief if Gabriel Jesus continues to thrive after making the seamless transition into English football. Guardiola, though, is already considering starting Aguero and Gabriel Jesus, potentially against Swansea in the league on Sunday. "They can play together," Guardiola said, "because Gabriel can play on the left side, in the position of Leroy." As if there was any doubt, Guardiola offered a firm assurance to Aguero. "Sergio remains an important player for us. He knows," Guardiola said. "Everybody knows that we cannot achieve our goals without his contribution." Aguero's most significant moment in a City shirt came four years before Guardiola's arrival. He netted the stoppage-time goal against Queens Park Rangers in May 2012 that clinched the club's first English title in 44 years and the first in the Premier League era. City lifted the trophy again in 2014 but is unlikely to win it again in Guardiola's first season. Not only is the Abu Dhabi-owned team 10 points behind league-leading Chelsea, but it is also out of the four Champions League qualification spots in fifth place. Chelsea manager Antonio Conte was at West Ham to witness City's win. "(Conte) has not to be too much worried about what he saw," said Guardiola, a title winner with Barcelona and Bayern Munich, "because they are 10 points in front ... so only Chelsea can lose the Premier League."